We should begin by pointing out the obvious fact that slip-on shoes aren’t just comfortable, they are also incredibly practical. You can put them on at a moment’s notice and be sure that you won’t struggle with the fitting even if your hands are full. These type of shoes have come a very long way over the years and have reached a point design-wise that they rival traditional shoes in terms of comfort and reliability. Having said that, we should point out that there are still plenty of sub-par models out there, mostly in the low-end range of the spectrum. To ensure that you’re getting the right stuff, we put together a list of the ten best slip-on shoes money can buy. Crafted with a stylish outlook, the Sunrolan Women’s Classic Genuine Leather Penny Loafers are the ideal slip-on shoes that can be worn to work, a casual outing or just to go shopping. Featuring a classic slip-on design, this shoe is made with 100% leather and comes with a robust flexible rubber outer sole that is injected. Equipped with a high-quality lining, it offers optimum breathability and is moisture absorbent. Uniquely designed with a pleated round toe style with elegant contrast stitching, these hand tailored shoes are the perfect addition to any woman’s wardrobe. Available in a variety of colors, Toms Women’s Classic Canvas Slip-on Shoes are the ideal pair of slip-on shoes for parties, shopping, dancing, ballet, jogging, walking and more. Featuring a simplistic slip-on design, the shoe is crafted with an elastic U-shape goring on the top to help with ease in putting on and taking off. Constructed with an EVA synthetic sole that is slip-proof, it features an ultra-lightweight exterior that is both durable and surprisingly flexible. Thanks to its soft, padded memory foam insole, it offers optimum comfort throughout the day. Available in a wide assortment of beautiful colors and patterns, the Harence Women’s Soft Comfort Leather Slip-on Shoes feature an all leather exterior, interior and insole with a rubber outsole. Uniquely crafted with a pillar-like design, the outsole of these shoes provides a massaging effect while walking, offering optimum comfort at all times. Durable, lightweight and breathable, its rubber outsole is resistant to slipping and provides a good grip on all surfaces. Ideal for walking and leisure of any kind, these shoes can be worn indoors as casual sandals. Considered one of the biggest brands for manufacturing stylish men’s dress shoes, Clarks has always brought forth quality shoewear to their long list of exquisite shoes. 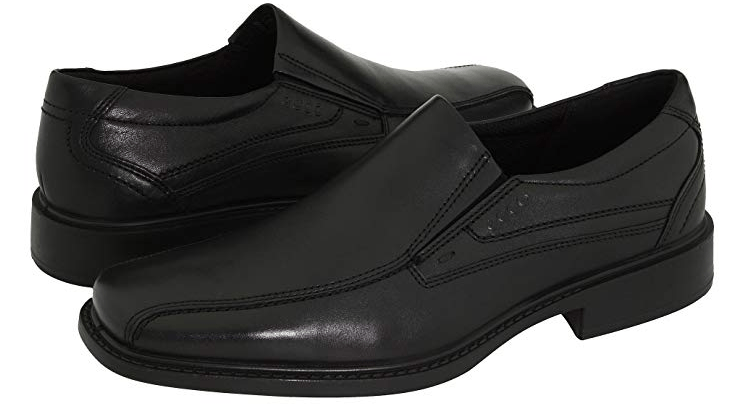 The Tilden Free Slip-On Loafer from Clarks is a leather, imported, premium grade pair of shoes that features a heavy-duty synthetic ultra-flexible sole. Lightweight, durable, and comfortable, these shoes include a well-padded insole made from high-quality memory foam that ensures your feet are comfortable throughout the day. Crafted from 100% premium quality synthetic leather, these slip-on sneakers from Steve Madden feature a stylish, modern quilted design and pattern. Available in a variety of colors, these shoes are made with rubber soles that offer an optimum grip on any surface. With a shaft that measures ‘low-top’ from the arch, it comes equipped with elastic goring on both sides to help give you a good fit. Featuring a platform measuring just one inch, these shoes come with a well-padded footbed that can be removed along with an upper-sole and lining that is 100% handcrafted. Featuring a heavy-duty synthetic sole, the Clarks Men’s Cotrell Step Slip-on Loafer are premium quality shoes designed for any occasion. Made with 100% imported leather, these shoes are light in weight and super-durable. With a heel that measures 1.5 inches high, it comes designed with a non-marking outsole with an upper that allows for optimum breathability. Offering high levels of comfort, these shoes feature an Ortholite memory foam that is soft and does not burden the feet in any way. With the Men’s Segment Slip-on Loafers from Skechers, you get both a decent grip and decent comfort on account of the fact that they are surprisingly flexible despite their stylish design. Made with 100% genuine imported leather, these shoes are crafted and designed with stylish contrast stitching, a well-padded collar for comfort and an inset pull-on tab which is located at the tongue to help slip on the shoes with ease. Thanks to its dual elastic goring on both sides, it provides a good snug fit while also coming equipped with an additional gel-infused memory foam that adds softness to the insole. 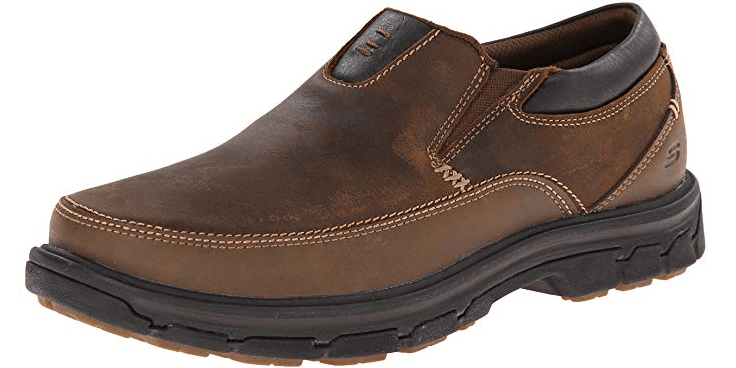 Made with 100% premium grade leather plus fabric with a textile inner lining, the ECCO Men’s New Jersey Slip-On Loafers are heavy-duty shoes that can be worn for casual or official purposes. Featuring a synthetic sole with a rubber-like PU outsole, these shoes come with a bicycle toe-pattern with elastic-goring inserts on the sides. Comfortable, lightweight and easy to slip on, they come with a low stacked heel and a platform that measures approximately 0.5 inches for added comfort. The Converse Women’s Chuck Taylor All Star Shoreline Low Top Sneaker are premium grade slip-on shoes made from 100% premium grade textiles and fabric. Featuring a heavy-duty rubber sole that is impressively slip-proof, this shoe is equipped with a low-top shaft from the arch of the shoe. Equipped with fixed laces with a unique design that does not require any tying up, the shoe is crafted with an elastic collar that is easy to slip on and take off without any hassle. 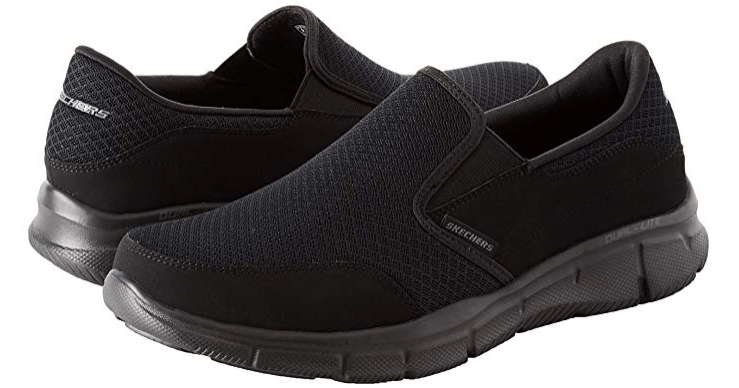 Few slip-on shoes can rival the Skechers Men’s Equalizer Persistent Slip-On Sneaker when it comes to grip and flexibility. Made from 100% premium quality synthetic materials, this exquisite shoe comes equipped with a mesh fabric on the exterior that offers optimum breathability. Including a cushioned collar for comfort, it comes with a soft memory foam insole that does not burden the feet. Thanks to its shock absorbing FlexSole and lightweight midsole, it is great for walking, shopping, jogging, or any other activity that involves a lot of walking or running.